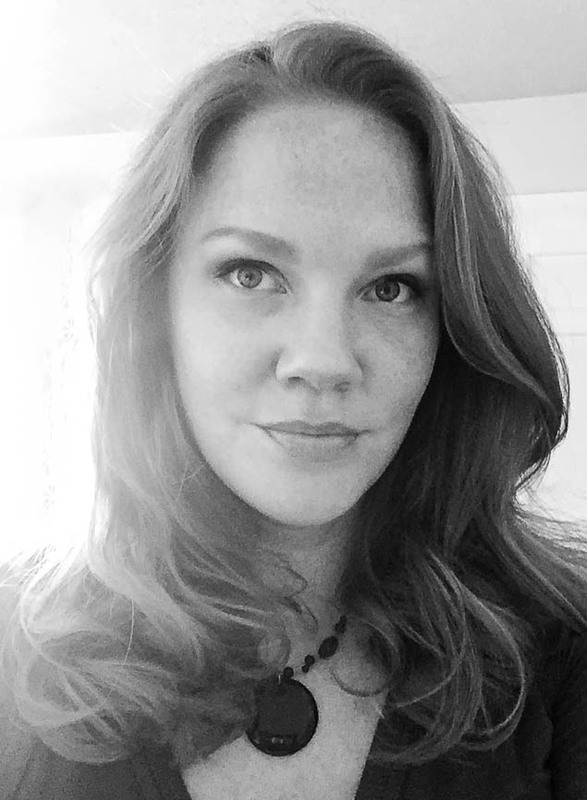 Hello Eighteen25 friends! 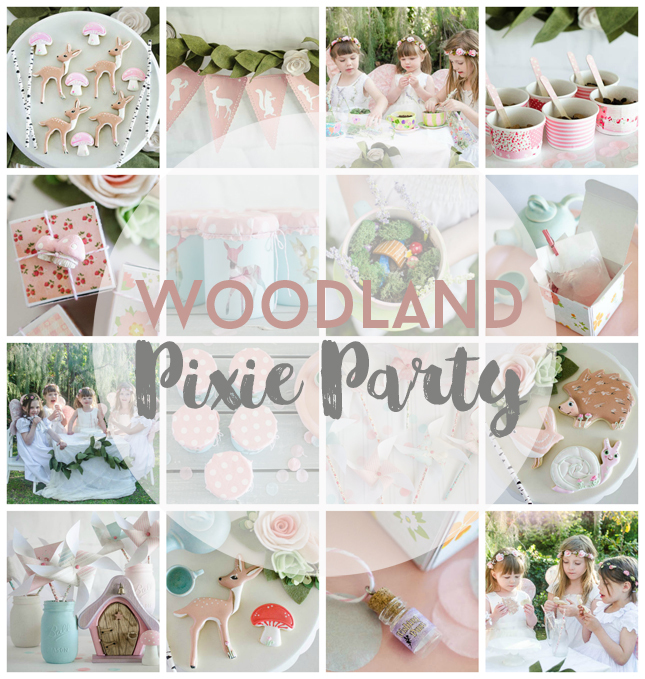 It’s Rachel from Fawn – Handcrafted Celebrations and I’m here today to share a fun Woodland Pixie Party we recently had. 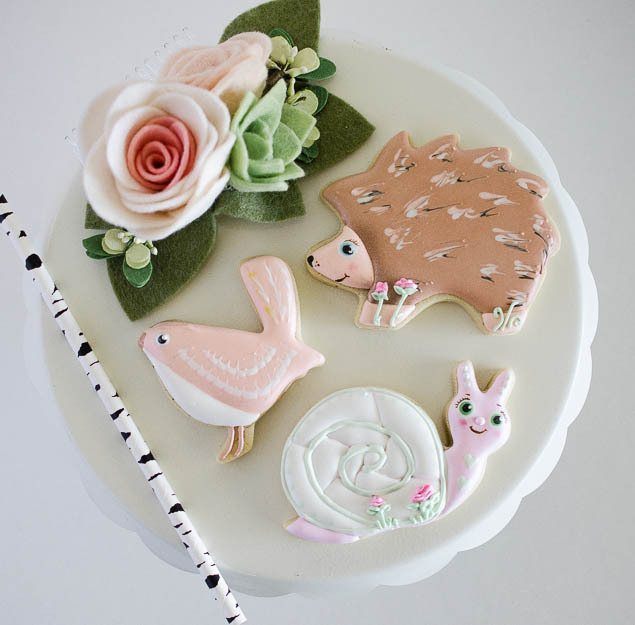 I adore spring and decided I just HAD to throw a party to celebrate the season of new beginnings. 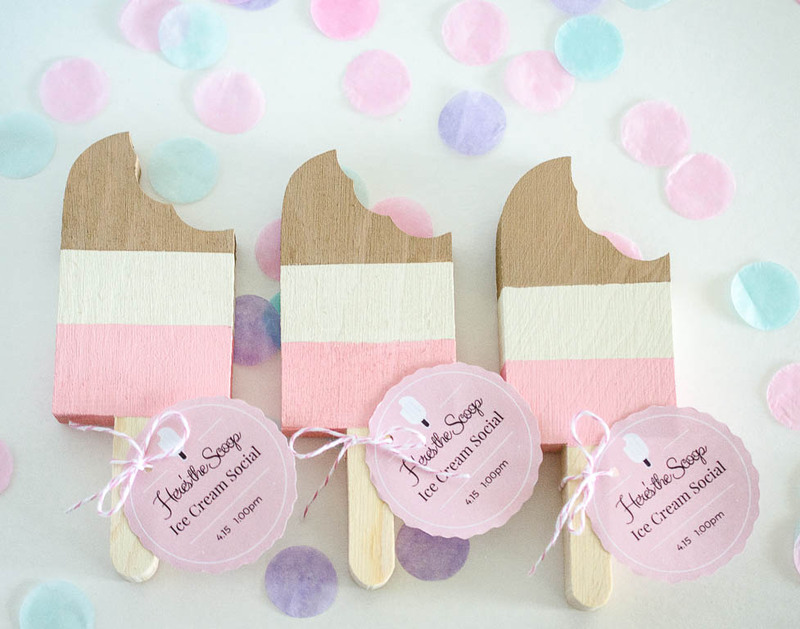 I love giving “out of the box” invitations to parties. 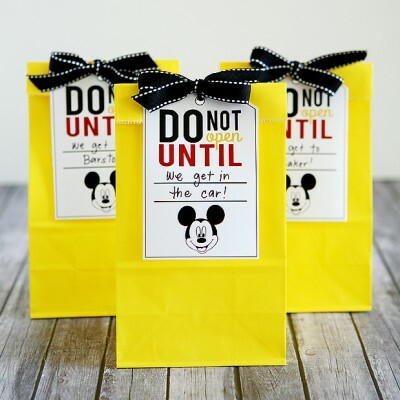 I think they set the tone for the event and get the little guests excited for the party. 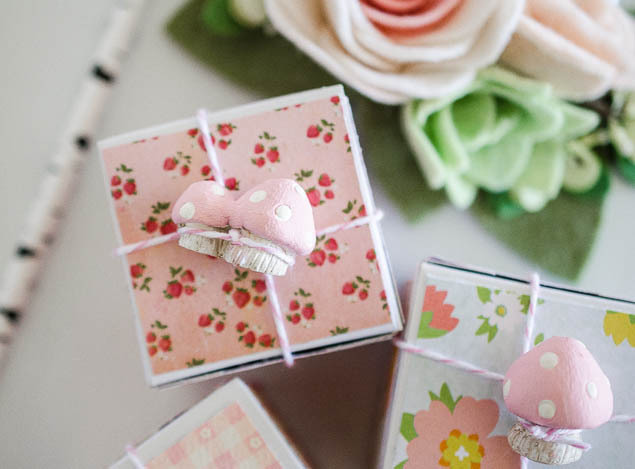 These pixie invites came in tiny fairy sized 2″ boxes and were perfect for tucking the little invitations inside. 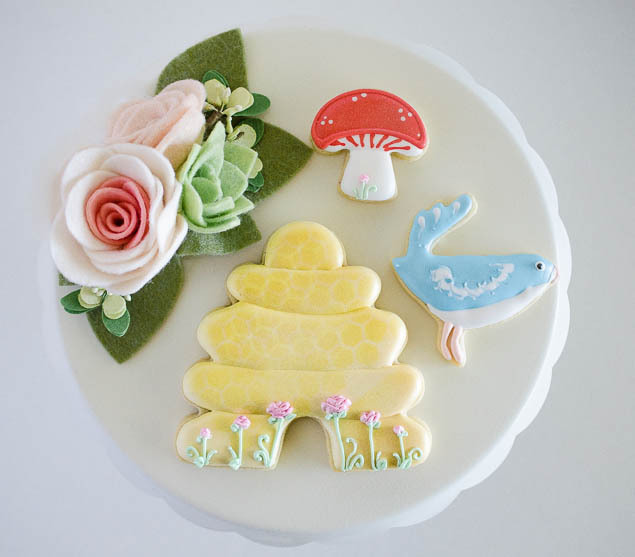 I covered the box with pattern paper, attached a toadstool to the top and secured it with bakers twine. 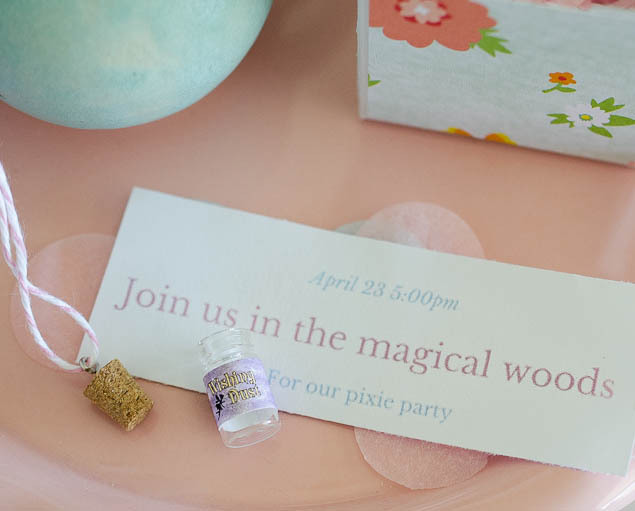 ….she found a tiny fairy bottle with the invite tucked inside. 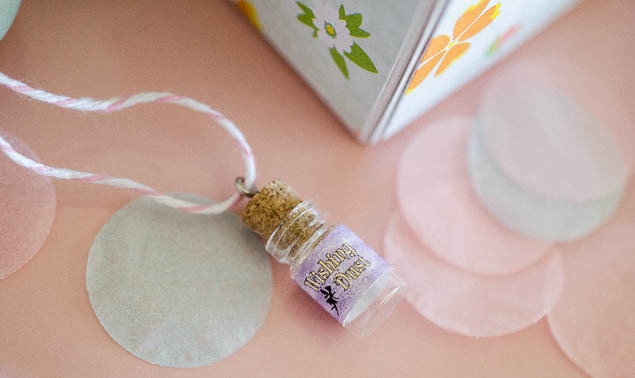 I added a bit of bakers twine through the top of the bottle so the girls could wear a bit of fairy dust as a necklace. The woodland fairy banner was probably my favorite thing to make for the party. I found some pixie images online, printed them and then cut them out. 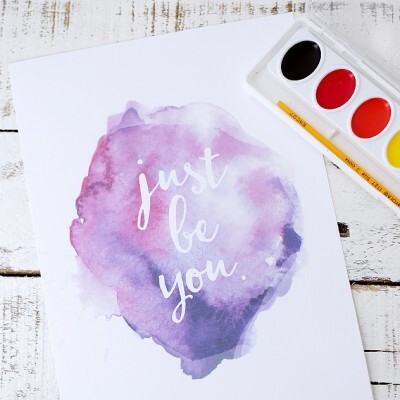 ( I don’t have a Silhouette machine but I’m sure this project would be much easier if I did!) 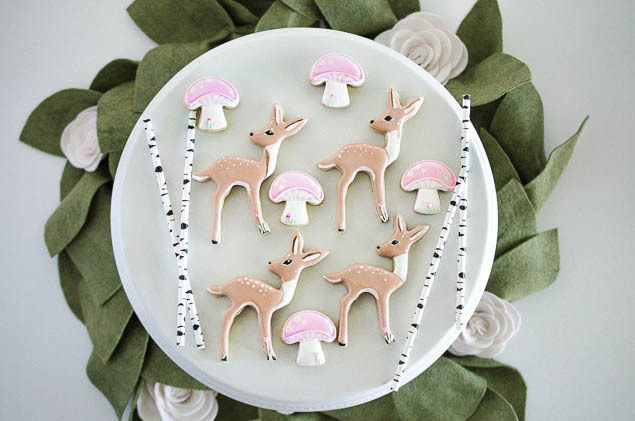 I then placed the woodland images on the banner, painted the banner pieces pink, let dry and then removed the images so the woodland silhouette was left behind. 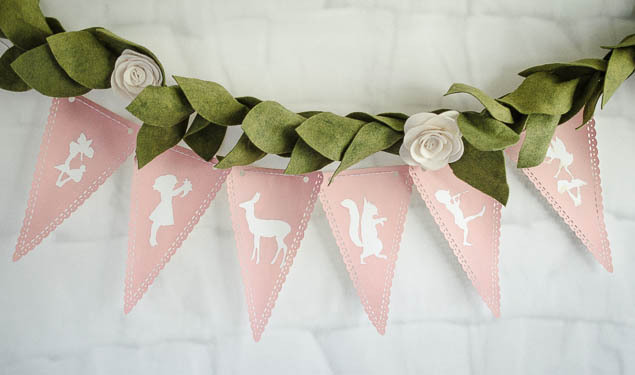 I paired the banner with this sweet felt leaf garland to give it even more of a whimsical woodland feel. 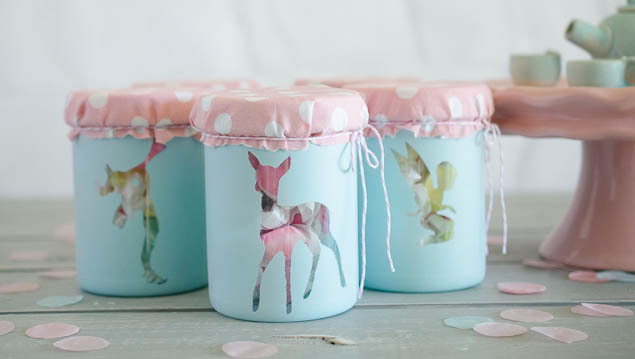 Here are the woodland images in use again but this time I used them on mini favor jars. 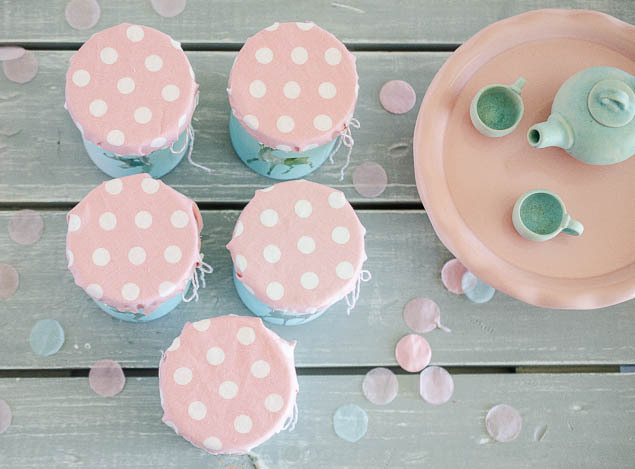 I used a bit of pink polka dot fabric to attach to the top of the jars with bakers twine. 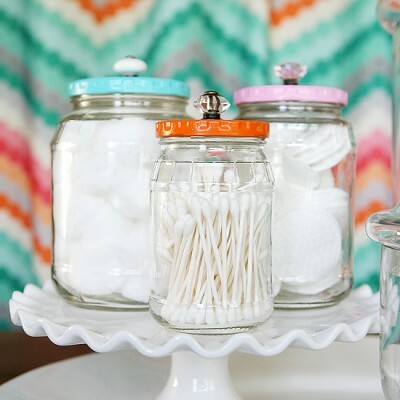 The jars were filled with yummy taffy in happy spring colors. 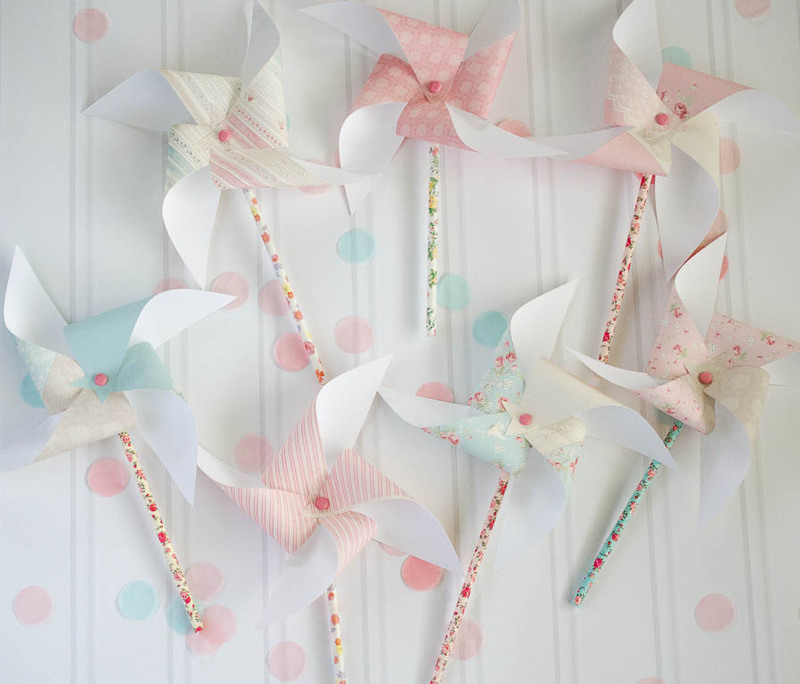 Each little girl received a pretty pinwheel to take home. 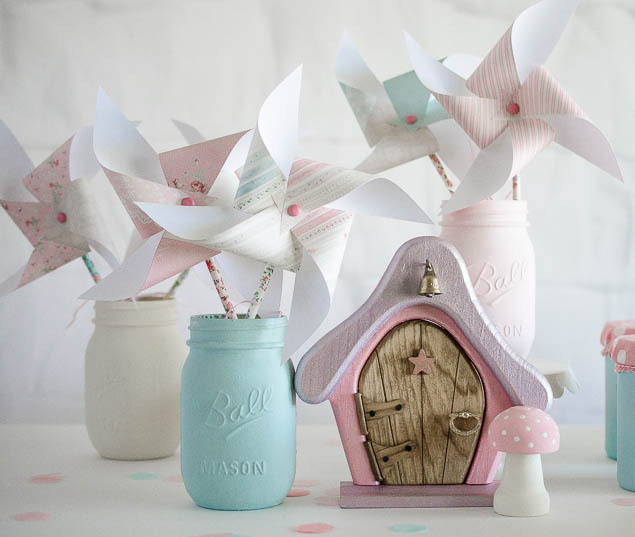 I used floral straws for the handles and attached soft pastel colored paper for the pinwheels. 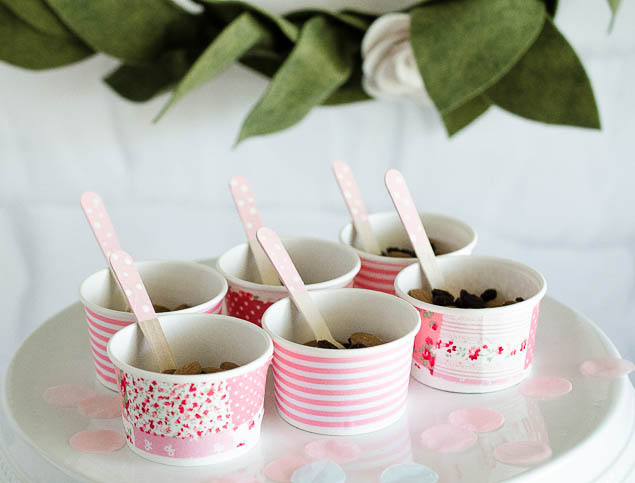 The fairies couldn’t dine on cookies alone so I filled tiny cups with nuts and berries and added teeny tiny spoons to go with them. 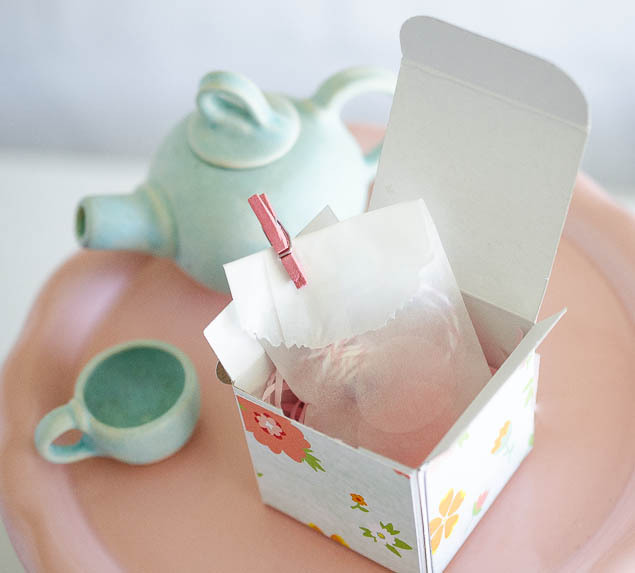 I had some extra fabric strips so I dressed the cups up a bit by attaching the strips around the cups. 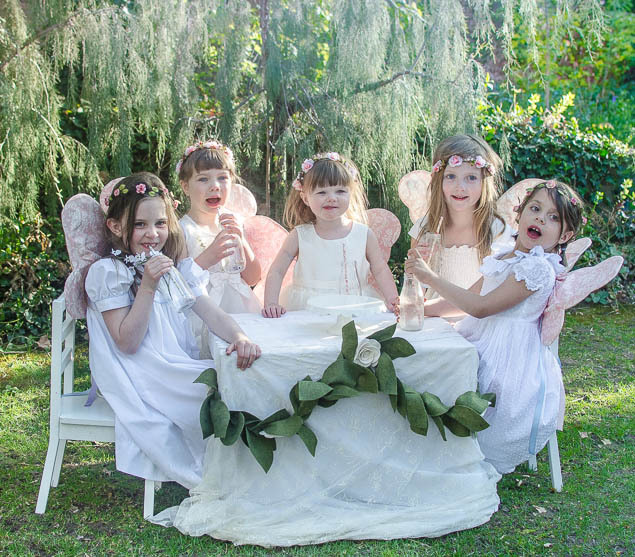 The pixies getting ready to party! 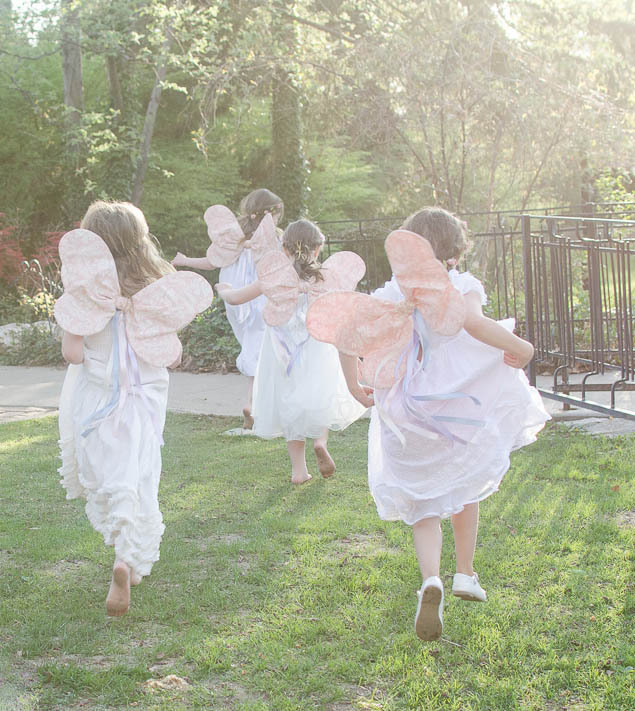 The fairies wings are from the dollar store and my sweet friend covered them in fabric for me since I can’t seem to sew a straight line. 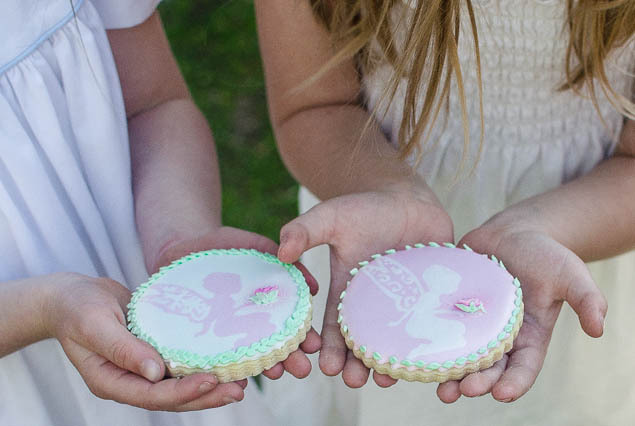 The girls caught a couple fairies in cookie form and promptly devoured them. 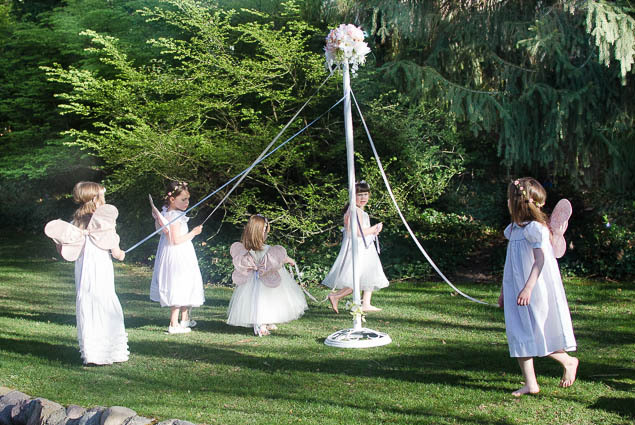 What is spring without a beautiful maypole? 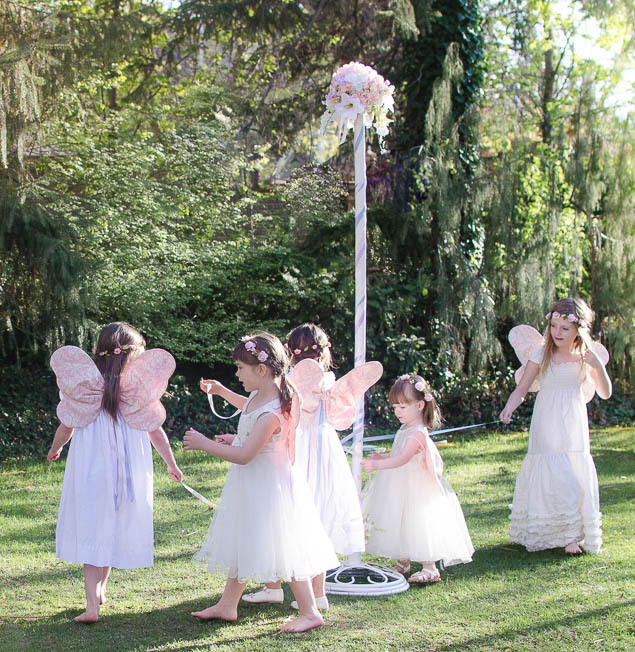 The fairies twirled and danced around the maypole and loved every minute of it. 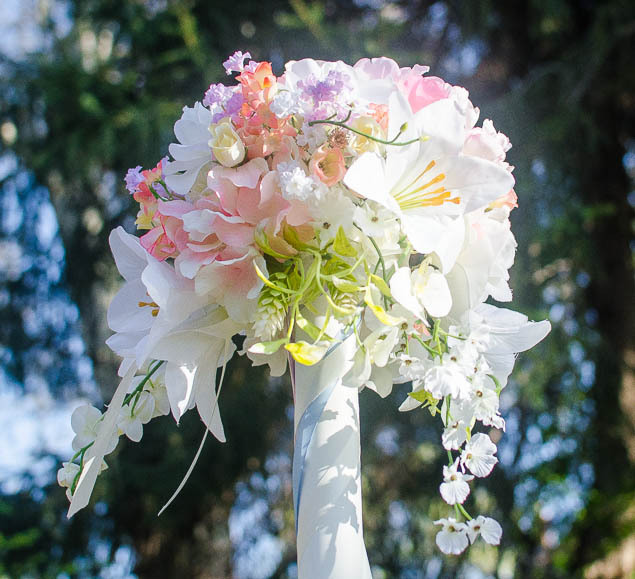 My amazing friend made this by spray painting an old umbrella stand, adding a pvc pipe to the stand and attaching a flower bouquet to the top. It was gorgeous! 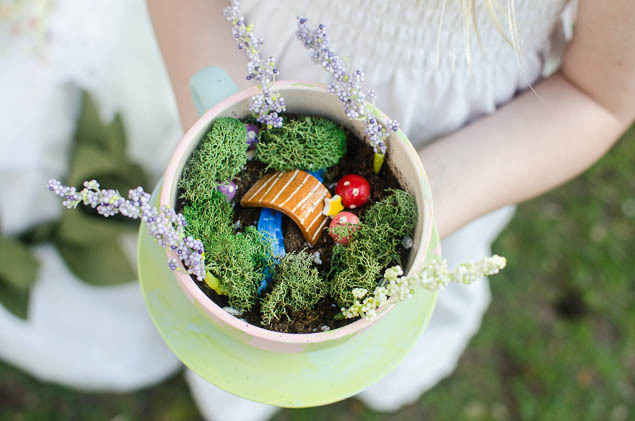 I adore fairy gardens and thought it would be fun for the girls to create their own little pixie paradise. 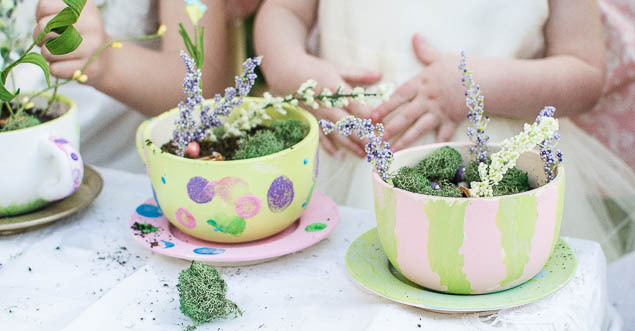 Each fairy painted her own ceramic tea cup and filled it with toadstools, moss, flowers, a bridge and other fun fairy sized decorations. 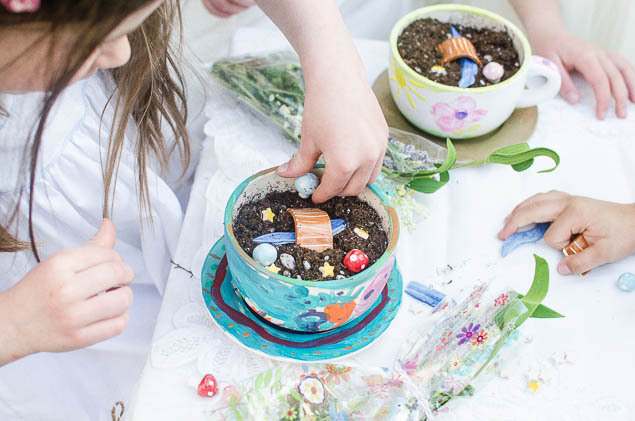 I loved seeing the creativity shine through each girl as they created her own gardens. So fun to see how they all created something different! Here’s the finished product. 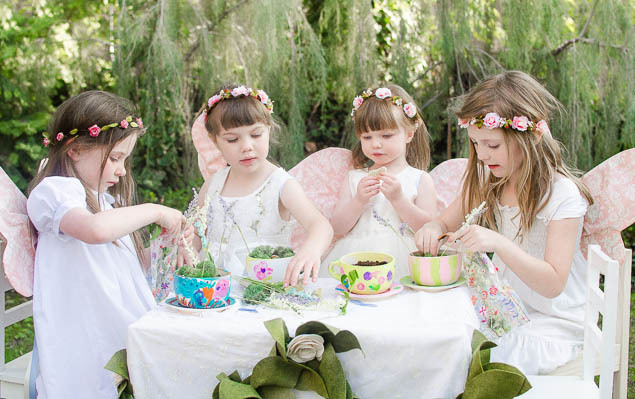 The girls were so thrilled with their gardens and made wishes that fairies would find a new home in their tea cups. 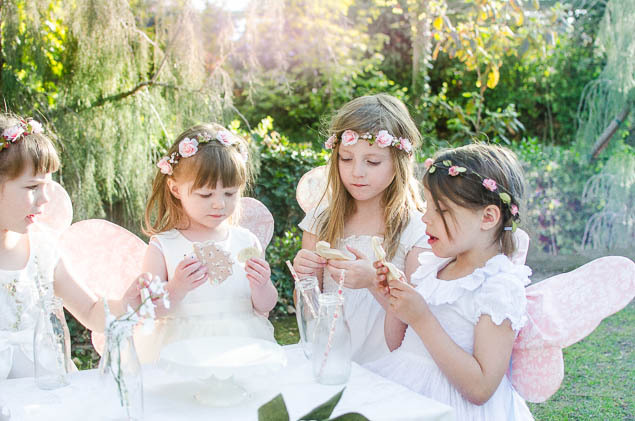 The party came to a close with the girls dancing, twirling and making wishes. It was truly a magical afternoon! 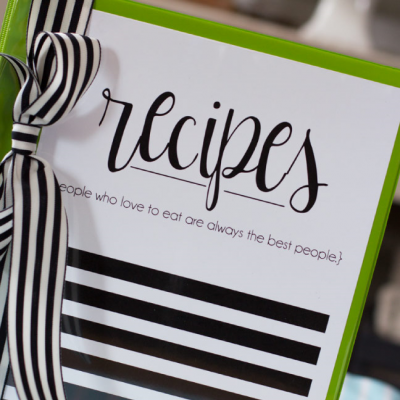 and check out these other fun party ideas! Unbelievable! 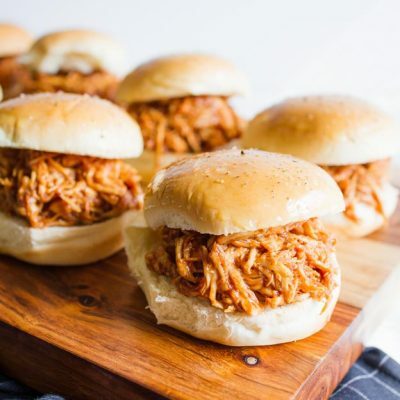 This party is just too good to be real! Love it! 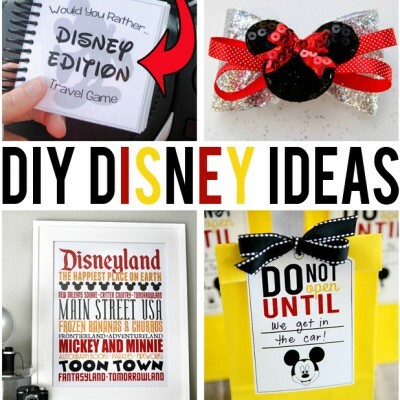 I want to do similar for my daughter this summer. Can we please get a tutorial on the wings? thank you!!! The wings are available on Etsy. He shop is called SpinningLilyBoutique! Oh Rachel! 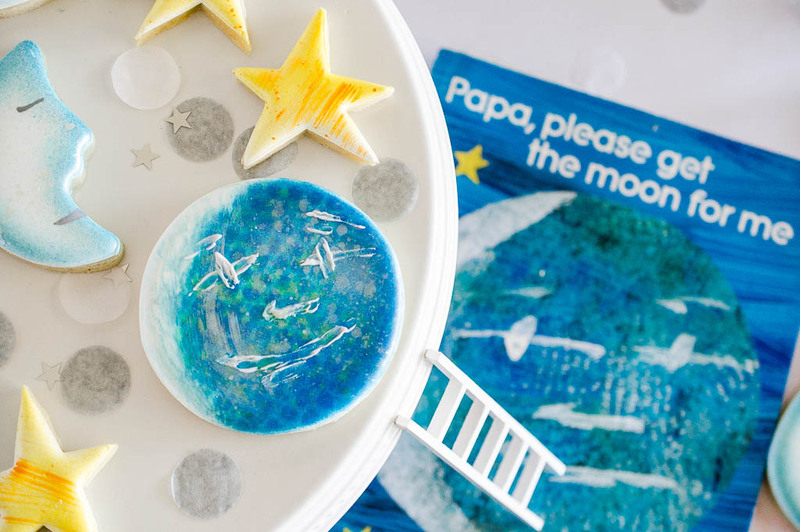 So many LAYERS of creativity! One surprise after another! You are my hero and all the lil girls too!!!! !